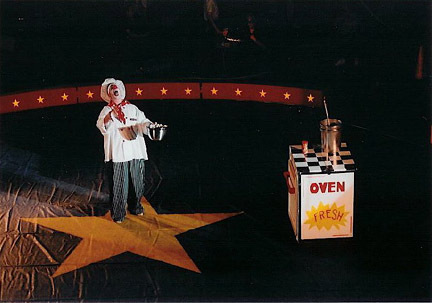 Pat Cashin is a New Jersey based writer, performer, and clown who has worked with several leading international circus companies. He has been described as “an inspired architect of slapstick circus silliness” whose performances are “a cartoon cavalcade of idiosyncratic oddities and imaginative absurdities” and that he is a “passionate practitioner of his ageless, eccentric art”, which is really just a long-winded way of saying that he’s a circus clown that thoroughly loves his job. A 1997 graduate of the Ringling Bros. and Barnum & Bailey Clown College, he began his career with Hansen’s Spectacular Circus Thrill Show and has become a seasoned veteran with Circus Spectacular, Circus Royale, the Hamid Circus, the Ringling Bros. and Barnum & Bailey Circus, the Clyde Beatty-Cole Bros Circus and Caesar’s Royal Roman Circus at Caesar’s Atlantic City Hotel and Casino. He was chief “Producing Clown” with the Dingbats, a team of traveling baseball stadium clowns and holds the distinguished position of ‘Stupidvisor of Pedia-tricks and Clownocology’ of the Jersey Shore Clown Doctors program at Jersey Shore University Medical Center in Neptune, NJ. He has toured as both a clown and a comedy ringmaster throughout the United States. Pat is perhaps most known for an award-winning Visa Check Card commercial in which he appeared with multiplying bunny rabbits which premiered during the 2001 Super Bowl. 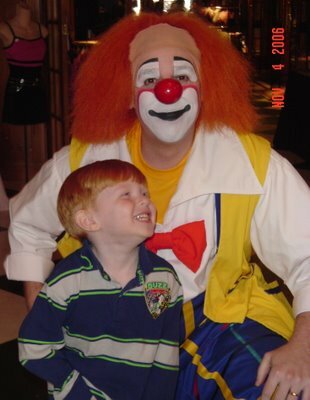 Pat is also the founder and chief operator of http://www.clownalley.net, one of the internet’s best resources for information, photos, and videos on classic circus clowns. Mr. Cashin, his wife, young son and dog all reside together on the Jersey Shore.